“Stopping!” I shouted to the riders behind me. We all skidded to a halt where the singletrack mountain bike trail crossed an ATV trail. I’d spotted something weird in the woods and wanted to check it out. The Esker Trail, near Cable, WI, provides some pretty amazing scenery and a great ride, hike, snowshoe, or fatbike. About 14,000 years ago, near the end of the last ice age, this trail was buried under a mile or more of glacial ice. Rivers of meltwater coursed along the glacier’s surface and plunged downward through crevasses, or vertical shafts called moulins. The rivers of meltwater didn’t just disappear, though. Once one poured down the moulin, it began to flow under the glacier. Punky ice above was easier to erode than frozen ground below, so the river created a tunnel for itself in the glacier. Snaking along, often with several sinuous channels braided together, this sub-glacial river dumped tons of sediment into its riverbed. In response, the river’s tunnel expanded higher, and the water deposited even more sediment. Once the ice was gone—having gushed away in a torrent of melt—we were left with a long, sinuous, steep-sided ridge called an esker. Which just happens to be a great place for mountain biking. Eskers make great habitat, too. Pines and oaks thrive in the well-drained soils. We biked through grove after grove of these trees, with glossy, ripe blackberries lining the trail. All those oaks occasionally attract a weirdo, though, and that’s what caught my attention. Dark, scabby blotches marred the pale khaki leaf litter. Based on a series of recent “nature identification” requests I’d had recently, I had a good guess about their origin. Once those seeds are dispersed, things really get weird. Bear corn’s multitudes of seeds are minuscule—somewhat reminiscent of fungal spores—which also happen to be plentiful in pine and oak woods at this time of year. 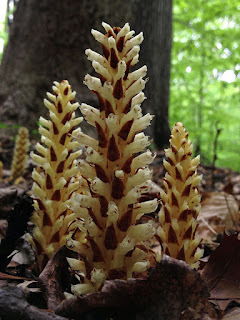 As with fungi, the bear corn’s seeds disperse easily, and can stay dormant-but-viable in the soil for about 10 years. This gives them the best chance possible to accomplish what seems like an impossible task. The tiny seeds have almost no energy reserves, and no means of producing food for themselves (that would require chlorophyll). If a seed is to succeed, it must find food immediately upon germinating, or die. The food it seeks is sugar stolen from an oak tree. Therefore, the seed delays germination until it senses chemicals exuded from oak roots. The chemicals don’t travel far through the soil, so if a seed gets the go-ahead, salvation must be near. A baby root called a radicle grows toward the signal, guided by chemotrophic attraction. Once contact is made with an oak rootlet, the bear corn’s own tiny root immediately starts sucking sugars from its host. Using sugars from the oak’s photosynthesis, the bear corn forms a nodule on the root. The nodule grows and multiplies, gaining strength until it can support a flower structure and send its own miniscule minions into the world. Then the fruiting stalk withers into the weird, crumbling, black patches we’d just encountered. This parasite doesn’t seem to have a noticeable negative impact on its host, but why would an oak allow a freeloader to steal its hard-earned sugar? The answer may lie with those mushrooms spotted earlier. Oaks readily form beneficial mycorrhizal relationships with dozens of species of fungi. The additional nutrients and water that the fungal mycelia provide may be one reason that oaks can survive in dry, sandy soils. Perhaps the bear corn’s seeds duplicate a fungus’ flirtatious attempts to initiate a relationship, and the oak lets down its guard. From sandy glacial sediment grow drought-tolerant trees which are assisted by beneficial fungi and robbed by sneaky imitators. As we ride off down the trail, it’s clear that this esker’s sinuous path connects more than just points on a map. The mist abated, but dense clouds still hung low over the lake, their wispy undersides tickling the dark tips of trees. As we drew near the narrow, piney peninsula at the north end of Lake Owen, a bit of white emerged from the gloom. 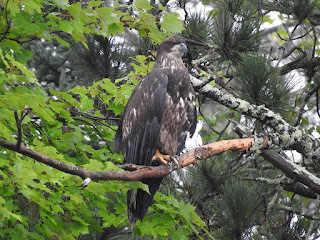 Through my camera’s zoom, I spied on a scruffy-looking adult bald eagle, its feathers matted from the damp weather. Although the supra-orbital ridges above eagles’ eyes often make them look fierce, today the expression seemed to lean more toward grumpiness. That’s just projecting our emotions from the gray day, though, since the ridge of bone is an adaptation that protects their eyes from injury, glare, and perhaps even rain, but doesn’t truly convey mood. This adult eagle had more reason to be tired and grumpy than we did, though, since its very large chick was begging for food just around the corner. Our raingear-clad Loon Pontoon Tour puttered toward the loud chirping, as we scanned the large clump of sticks high in a red pine tree for any signs of movement. During the past few weeks I’ve spotted moving feathers in the nest. Not a great view, but still a fun sighting. The nest was quiet, though. Where was the chick? There! 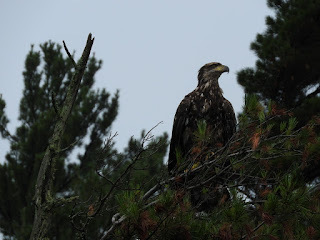 Midway up a dead, lichen-covered pine, about 40 feet from the nest, sat the chick. The hulking, brown figure could hardly be called a chick, though. It was a recently fledged juvenile who had grown its first set of real feathers and left the nest. Most resources agree that bald eagles typically fledge around 10 weeks of age. Counting back, that puts its hatch day in early June. Though full-size, this young eagle looked quite different than its majestic parent with the snow-white head and tail. Shades of brown covered its head and body, but the damp day had matted some of the feathers and revealed a mottling of white where the basal portions of contour feathers showed through. Its eyes and beak were dark, too, in contrast to the yellow facial features of an adult. Dark wing and tail feathers drooped low. Like gangly teenagers, juvenile eagles look bigger than their parents. In some cases, a well-fed youngster actually may weigh more than their harried caregivers, but that doesn’t seem to be common. Instead, their larger appearance is due to longer flight feathers, which help them compensate for a lack of flying skills. Their next set of feathers will decrease in size as a nod to increased agility. Those new flight feathers come in gradually, though, and during the eagle’s second summer its wings and tail sport both longer and shorter feathers. It may seem odd that our Loon Pontoon Tour spent so much time watching an eagle, but as with everything in nature, the lives of these two species are quite connected. For one, eagles are the main predator of adult loons, and also attack loon chicks. Loons even have an eagle-specific alarm call to warn their chicks of danger. The animosity between the two species may be due to their shared habitat and competition for fish. They probably don’t realize it, but these adversaries share many common enemies as well. Water pollution, habitat loss, harassment by humans, and lead poisoning are just a few. 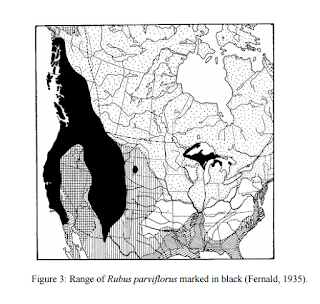 Loons and eagles also share quite a few elements of their life histories. Both black/brown-and-white birds eat mainly fish, are formidable predators, raise just a few young and care for them diligently, take several years to reach maturity, and look distinctive while immature. Last week, on a different lake, we spotted three juvenile loons in their first true plumage. Just like this young eagle, they were mottled brown and white with dark eyes. Those loons will migrate to the Gulf of Mexico this fall, and stay there for three to four years. Once mature, they’ll molt into their snazzy adult feathers and fly north. If they’re lucky, they may start breeding immediately, but most loons don’t earn a territory until age six. Eagles have a similar youth, with two main exceptions: they wander widely during their immature stage instead of staying south, and their plumage changes a little bit each year until they become adults. Not far down the lake, we spotted a great example of this. An immature bald eagle, hatched in a previous spring, perched atop a white pine tree. 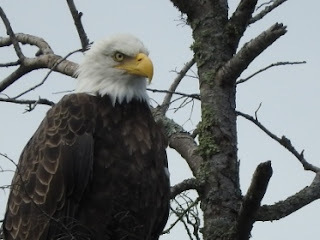 In contrast to its younger cousin, this eagle had quite a few pale feathers on its head and neck, with a dark eye stripe reminiscent of an osprey. In addition, its beak was a lighter shade of gray, and had more yellow at the corners. Its eye color was lighter, too. All these characteristics identify this bird as a 2.5 year-old, who would have been born in spring 2014. By their fourth summer, as 3.5 year-olds, eagles have near-adult plumage, with pale heads and tails that still show some gray and brown flecking. Over the next two molts their white areas just get more pure. Despite the drizzle, fog, and low clouds (or perhaps because of them) both loons and eagles were cooperative for our tour of the lake. What a treat to observe these two majestic birds and learn a little more about their lives! We decided to take the long way home, which turned out to be the right choice. The ravine along Chester Creek in Duluth, MN, was cool and shady and a much nicer stroll than the sunny side streets on a hot afternoon. This section of the Superior Hiking Trail is in the middle of town, but feels like a wilderness area. Lush vegetation lines the steep hillsides and a variety of flowers bloom through the summer. Our casual conversation stopped mid-sentence, though, when I spotted a splash of vivid red against the green leaves. Thimbleberry! In an instant, the red was gone—but its bright flavor burst onto my tongue. I picked another, and another. The whole trail was lined with ripe berries, and more glowed in the deep shade off trail, too. At first this slowed us down, as we stopped to pick more every few feet and revel in the intensity of their sweet-tart flavor. Then, when we realized the abundance of the crop, we sped up again, vowing to come right back with buckets. Thimbleberries are a thornless member of the Rubus genus, related to raspberries and blackberries. The delicate, red berries are big, and come cleanly off the plant, leaving a cavity big enough for your finger—hence their name. Their giant, soft, maple-shaped leaves often grow along latrine trails in the Boundary Waters, and make the best wilderness toilet paper available. An hour later the quart-sized yogurt tubs hanging around our necks were full of the pungent fruits. The second half seemed to take much longer to pick than the first half, though, since the berries smush down under their own weight. Because of their fragility, the berries really can’t be sold fresh. Eating them straight from the bush is the best plan. If you’re lucky enough to get several cups of thimbleberries, their jam is a treat. It’s hard to find them in that kind of abundance outside of the Upper Peninsula of Michigan, though, and for years I’d eaten thimbleberries a few at a time, and “settled" for making blueberry jam. Not long ago, I broke down and spent eight dollars on a small jar of thimbleberry jam from a roadside stand in Copper Harbor, MI. It was delicious. Michigan’s Upper Peninsula is the center of thimbleberry products in the Midwest. Jam is a substantial cottage industry up there. Northern Minnesota also contributes, but Wisconsin has a limited range. If you look at a map of thimbleberry’s distribution across the continent, the Great Lakes region makes up just a tiny blip on the map, and is completely separate from the other thimbleberry populations. Another, even tinier population of thimbleberries grows in the Black Hills of western South Dakota, like an island in the prairie sea. Then the Rocky Mountains and the West Coast show a much bigger area of abundance. These disjunct populations have long been a curiosity to scientists and botanists. How did these plants get separated from their friends? One theory (as far as I understand it) is that not long after the glaciers melted, thimbleberry would have enjoyed the cool, damp climate it prefers across much of the continent. Then, about 9,000 to 5,000 years ago, the climate warmed. During this Holocene Climate Optimum, warmer, dryer conditions forced thimbleberry out of the arid Great Plains. It was left to survive in refuges—like areas west of the Rocky Mountains’ rain shadow, at higher elevations, and near lakes—that still provided for its needs. Thimbleberry isn’t the only plant affected this way. A crazy, spikey plant called Devil’s Club grows mostly in the Pacific Northwest, with a disjunct population on Isle Royale in Lake Superior. 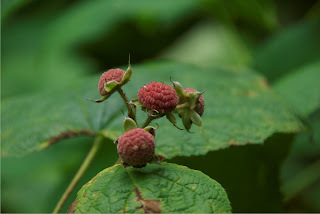 Weather and climate still impact thimbleberry every year. Warm spring weather facilitates successful flowering and pollination, and wet weather promotes tastier berries. This year was perfect! We went back to the patch again the next evening. All told, we made 13 jars of delightfully tart, ruby red jam. I feel absolutely, extravagantly, rich. What a good idea that was, to take the long way home. During their Great Lakes Adventure, these kids wanted to see a bog. We decided that a poor fen was close enough, and I knew of a lovely one to show them. Soon after we’d crossed onto the firmer mat of vegetation beyond the moat, someone almost stepped on a beautiful clump of oddly-shaped leaves. One of the kids exclaimed in wonder, and asked me if this was indeed the famous pitcher plant. It was, so of course we now had to get the same question on camera. Backing up a few paces, we staged a meeting in the fen by walking in from opposite directions and feigning surprise. Our paths crossed perfectly at the elegant clump of pitcher plants with three tall flowers and a bouquet of red-veined leaves. As I explained that the acidic, low nutrient habitat of bogs and fens drives the pitcher plant’s need for nitrogen and its resulting carnivory, I poured the contents of one water-filled leaf into a clear vial. I think I may have squealed in excitement. (You’ll have to watch the episode when it airs in November to find out for sure. Check for local show times at www.aquakids.tv) Two big flies floated at the top—one dead and one mostly dead. Those were soon to be prey, no big deal. Near them hovered a half-inch long, pale, segmented sea monster. It was this flesh fly larva that triggered my glee. Have you ever read about something new, and then a short while later encountered it for real? I don’t know about you, but I love that feeling of a dream come true. I’d recently learned about this creepy tenant of pitcher plants in the wonderful book North Shore by Anderson and Fischer. Now here was the critter, right on cue. Flesh fly larvae hatch while still inside their mother, and she deposits one wiggling baby in each pitcher plant leaf. If by accident two larvae end up in the same tiny pool, well, let’s just say that one leaf ain't big enough for both of them. Flesh fly larvae act as the pitcher plants’ teeth. Like Cookie Monster, they shred their food ferociously and let the crumbs fall where they may. Luckily, a cleaning crew is on the job. Tiny mosquito larvae of a species that only lives in pitcher plants filter feed on the suspended crumbs, surfacing occasionally to breathe. 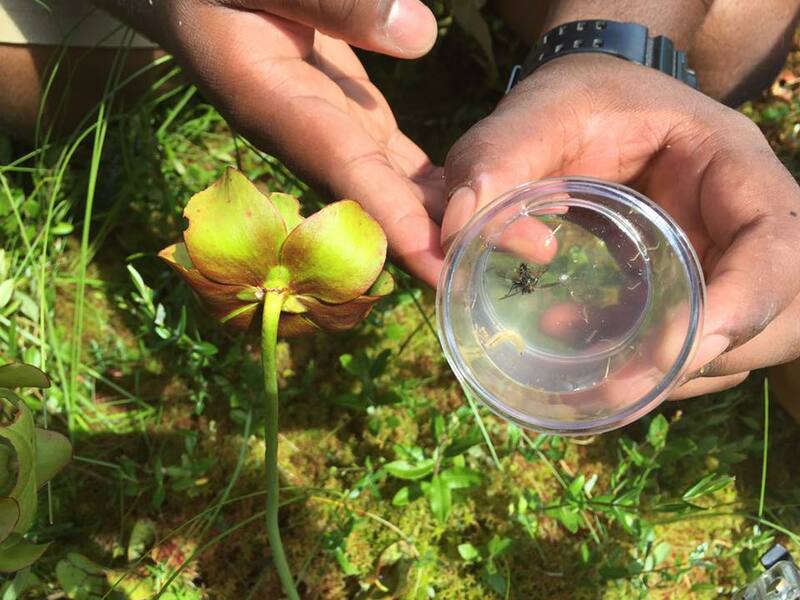 The habitat in a pitcher plant pool is so rich and rewarding that that larvae store up extra energy. The females of these well-fed larvae metamorphose into adults who do not need a blood meal in order to lay eggs. Now those are mosquitoes I can appreciate. We all oohed and aahed at the contents of the vial for a moment, and then I pulled out my knife. Very carefully I slit the pitcher plant leaf all the way from its slippery, nectar-laden lip; down the red-veined, slightly sweet side; to the narrow tube at its base. Ewww! we shouted in delight as a black mass of dead insect parts writhed in the sun. The dead stuff wasn’t moving, of course, but their decomposers were. Down here, where the leftovers settle, midge larvae draw their oxygen directly from the water. With powerful mandibles, they break down the insect bodies even further, releasing more crumbs to the mosquitoes, and plenty of nutrients to the pitcher plant. This trifecta of larvae is a classic example of resource partitioning and finding your niche, but there’s even more to the story. A whole community of microscopic rotifers, mites, protozoans, and bacteria feed on the leftovers and each other. You might think that the pitcher plant would resent all of these freeloaders. In truth, a diversity of organisms increases both the digestion rate and the availability of nutrients. The pitcher plant absorbs plenty of good stuff through special cells deep in the bottom of its leaf cup. The kids, the cameramen, and I soon moved further into the fen, exploring the dainty yellow flowers of horned bladderworts, the glistening leaves of sundew, and tart bog cranberries. Throughout the day I was impressed by their genuine enthusiasm, intelligence and humor. Finally, exhausted, I retreated to the shade to share some parting words with the camera. 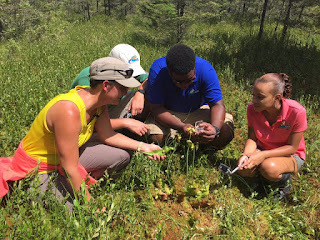 “Thank you Aqua Kids,” I smiled, “for helping me get even more people excited about bogs and fens!” Just like the critters in a pitcher plant, I think we made a great team! Find us on the web at www.cablemuseum.org to learn more about our exhibits and programs. 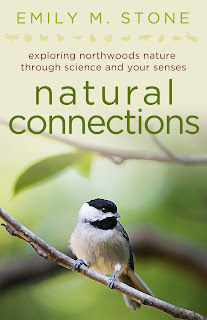 Purchase Emily’s new book at: http://cablemuseum.org/natural-connections-book/.